Scotland offers some of the most challenging climbing in the UK. One of the most popular activities has become widely known as ‘bagging the Munroes’. The term ‘munro’ was coined by Sir Hugh Munro who produced a list of peaks in 1891 to classify a mountain which was 3,000 feet or higher. There are 284 Munroes in Scotland and over the years, climbers have become fascinated with climbing them. Once you’ve climbed one, it means that you have ‘bagged’ it. If you’re out Munro walking in Scotland, you could probably expect to bag about seven in a day, depending on the weather conditions, your fitness and experience and the Munroes you select. For many climbers, the aim is to complete all 284 at which point you can claim to be a ‘Munroist’. Other people are driven to try to compete against speed records which have been set by other climbers. For example, two of the most popular rock climbing challenges are to see how many Munroes you can bag in one day whilst others set themselves the challenge of how quickly they can bag all 284. The most famous of all the Munroes is Ben Nevis which, at just under 4,500 feet, is the UK’s highest mountain. If you’re planning to go Munro walking in Scotland, you’ll need to make the usual plans and take the same kind of safety precautions as you would on any rock climbing trip. Although you don’t necessarily need to be a highly experienced mountaineer to go munro walking in Scotland, you should not try to rush into any climbing speed challenges unless you’ve had a considerable amount of previous experience. Make sure you do some research first before you climb as some of the Munroes present stiffer challenges than others which can include treacherous inclines and steep descents so it’s important that you get yourself a guide so that you can feel safe in the knowledge that the Munroes you’re climbing are suitable to your level of skill and experience. A map and compass or GPS device should also be taken. You should also ensure that you take sufficient water. You should never underestimate the Scottish weather if you’re out doing any kind of hiking, rock climbing or munro walking in Scotland. It can be very fickle and unpredictable due to Scotland’s latitude and its exposure to the weather systems coming off the Atlantic. Even on a calm and sunny summer’s day, the weather can take a dramatic turn for the worst, so make sure you check the forecast before heading out to go climbing. Even at the height of summer, freezing temperatures at the summit of a mountain, driving rain and fierce winds along with dense fog are not uncommon. 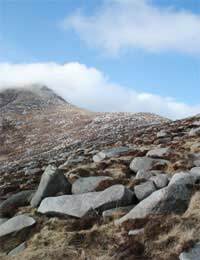 Therefore, you should be well prepared and take suitable climbing gear and clothing which includes several layers to protect you from the cold as well as waterproofs. It’s also recommended that you do your climbing in a group. If you insist on going it alone, make sure you let people know where you’re heading and what time you expect to return from your climb. Taking a mobile phone with you could save your life although don’t rely on always being able to receive a signal. The most popular time for climbers to go munro bagging is from May to September although don’t automatically assume that the weather will always be fine. As mentioned previously, when it comes to the Scottish weather, nothing should be taken for granted when it comes to your preparation and the climbing gear you take along with you. Winter munro walking in Scotland should only ever be attempted by the most experienced climbers. In winter time, certain Munroes present some of Europe’s most severe ice climbs and there are many deaths every year often due to climbers slipping on ice and slick rock. It also gets dark quickly in Scotland over the winter months and can often be pitch black by 5pm so if you must climb in winter, make sure you take a torch and a watch and keep an eye on the time. Just wanted to know why you have not featured the west highland way which I am hiking in may with my border collie and a friend. For most of us the Munros are a long way from home, so there’s plenty of driving involved just to reach them. That means you have to be pretty dedicated (and have plenty of free time) in order to bag even a small percentage of them. One summer, I promise myself, I’ll bag a few – all is out of the question. It's worth pointing out that even those working hard on it have taken an average of eight years to bag all the Munros - and there have been more than 4,000 people who've accomplished the feat, the youngest of whom was just 10 years old when he did a round of all the Munros. After re-measurements there are now just 283 Munros, so completing a round is just a wee bit easier!